A custom payment gateway (TSYS Acquiring Solutions) was added to the configuration of floreant pos. Another credit processing payment gateway was added and integrated with floreantpos. 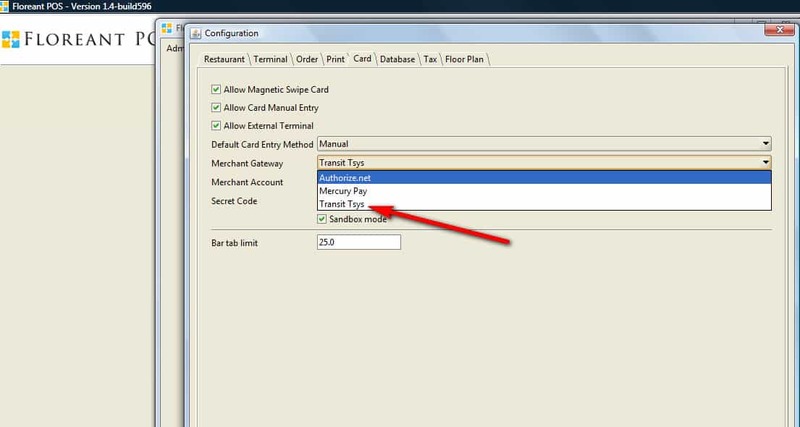 Https Xml post was used to authorize credit card using the transit sys tsys payment gateway. TSYS TransIT API File Specifications was used. A generate key request was sent first and a key is generated based on MID, DeveloperID and userID. A XML Sale Request was sent containing card details, the amount to be processed, deviceID etc. Complete testing was carried out as per the requirement of certification from TSYS based on their test scripts. Card SWIPE method was also incorporated and card trackdata including encoded trackdata was sent to the gateway for processing. Single track and double track data were integrated. Customer data was printed on the pos receipt.